Governor Ayodele Fayose of Ekiti State has advised the Federal Government to stop ruling the country with double standards. 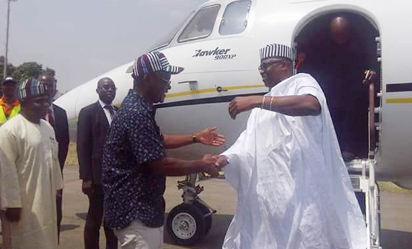 Governor Fayose stated this, on Thursday, when he visited the Governor Samuel Ortom, in Benue, to commiserate with him and the people of the State over the New Year attacks. The Ekiti State governor said a situation where a particular group who are unleashing mayhem on others are treated as sacred cows while others who perpetrate lesser offences are made to face the wrath of the law is a double standard and should not be allowed to continue. While describing the situation in Benue as nothing other than ethnic cleansing by the herdsmen, the Ekiti State governor who also announced a donation of N10 million to the state, urged Governor Ortom to be steadfast and stand firmly by the Anti-Open Grazing law. In the words of Governor Fayose, “When has Benue people become less than cows being killed for reasons of grazing? This country belongs to our forefathers who handed it to us. So any attempt to dislodge you will bring great consequences on those who want to dislodge you. “I went to the grave side today and I was moved to tears. How can people be slaughtered like cows. There is no terrorism more than what has happened in Benue and stressed the need for all hands to be on deck in order to defeat terrorism in the state. Responding, Governor Ortom, while thanking his Ekiti State counterpart and his entourage for the visit, regretted that the authorities did not heed his earlier alerts from Benue which could have saved those who were killed in the attacks. In the words of Governor Ortom, “Yes, we are mourning, we are grieved by the actions of these killers but if those who are responsible for providing security had heeded our alarm, those people may not have been killed. “Nigeria and Benue can never be the same. Benue too. There is going to be a turn around that has never been witnessed in this country before. I have thus decided to join my brother, Fayose to be outspoken on things that are not done rightly in this country. Anything that is not right here, I will challenge. How can you be beating me and don’t want me to cry. “Let there be justice, and transparency. We should stop giving the dog a bad name in order to hang it. That will not be accepted. I am elected to govern my people and this law is a product of the people. In Nigeria today, herdsmen and their cows have immunity and those charged with the responsibility of protecting lives and property of the people have taken charge to the extent that they have become mouthpiece for MAKH. This is not acceptable. The post Stop ruling Nigeria with double standard, Fayose tells FG appeared first on Vanguard News.